Likud MK Anat Berko pleased with resignations of MKs Zoabi and Zahalka, hopes MK Tibi will follow suit. 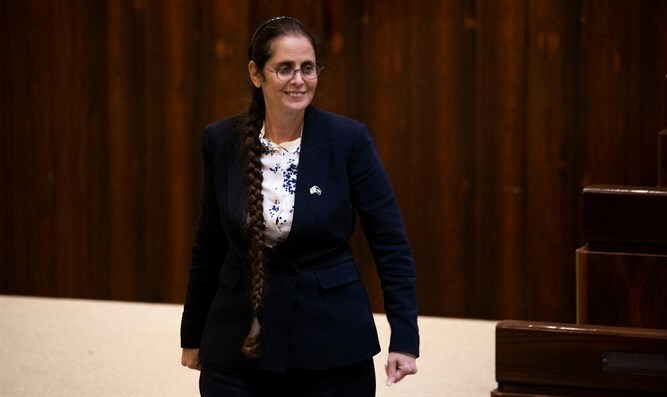 MK Dr. Anat Berko (Likud) expressed satisfaction with the fact that Knesset Members Hanin Zoabi and Jamal Zahalka will not return to the Knesset. "Unfortunately, the Joint List aligned itself with the extremists of Balad. It was characterized by extremism and subversion against the State of Israel and also by support of terrorism. It did nothing for the Arab public and represented the Islamic Movement and Abu Mazen more," Berko told Arutz Sheva on Wednesday. "If the split in the Joint List will produce something better for the Arab citizens of Israel, it will be a good thing,” she continued. "I think the Netanyahu government has invested a great deal of resources for the benefit of the Arab public - and to my regret, the Joint List in many cases worked against the State. I can only rejoice at the fact that MK Zoabi and MK Zahalka will not be in the next Knesset. These are two people whom the Supreme Court should never have approved as elected officials. They acted against the State on every stage. It is our mistake that we allow the enemies of Israel to sit in the Israeli Knesset," said Berko. She expressed hope that MK Ahmed Tibi, who split from the Joint List in order to run separately with his Ta’al party, will also not be part of the next Knesset. "I see MK Tibi as a very hypocritical person. He will not sit with me on any panels, he blocked me on Twitter because I tell the truth. MK Tibi continues to be the consigliere of Arafat. He is not loyal to the State of Israel but rather loyal to the Palestinian Authority and would be very suitable to serve in the PA parliament, but not in the Israeli Knesset,” said Berko. All three MKs – Zoabi, Zahalka and Tibi – have made controversial, anti-Israel statements during their time as elected members of the Israeli parliament. Zahalka has stressed that he does not regret any of his statements, including saying that he "prefers to die than to sing the Israeli anthem," and that the Israeli flag is "worse than a rag." Zoabi has in the past said she views sovereign Israeli territory as “occupied” Palestinian territory. Just recently, she was reprimanded by the Knesset Ethics Committee after she said during a speech in the Knesset plenum that civilians in Gaza were "murdered by soldiers." Days later, during a debate on a bill authorizing the expulsion of the families of terrorists, Zoabi described terrorists as “freedom fighters”. Tibi has in the past encouraged Arabs to disobey the “Muezzin Law” which would limit the use of loudspeakers during the call to prayer in mosques.